Paul Eccardt offers complete piano service in the Long Island / New York City metropolitan area. From piano tuning, regulation, voicing, and rebuilding to sales, troubleshooting, and refinishing, his years of piano craftsmanship and knowledge make him the ideal choice for taking care of any of your piano requirements. Paul is a Registered Piano Technician with the Piano Technicians Guild and a former employee of Steinway & Sons. 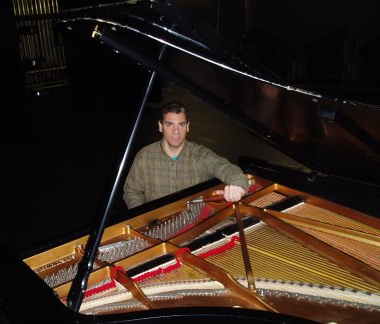 He is the piano tuner for many prominent pianists and institutions, and is pictured here tuning the Steinway concert grand in the auditorium at York College.